Int. Ch. Silkiss'd Watch Me Rock. Int. CH.Silkiss'd Watch Me Rock in Brazil. Connor is the litter mate to Tucker. 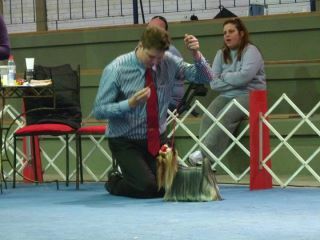 Emma handled him for his last major and AKC Championship. He is now down in Brazil with his new owners and has already achieved TWO Brazilian "4th BEST IN SHOW" placements and is on his way to a great South American show career.